I’m an independent Digital Consultant and Strategist for the UK non-for-profit sector. I forged my expertise in digital strategy development and implementation at some of the biggest Britain’s charities. I established Digital Leadership Ltd to help individuals, teams and senior management lead digital transformation in their organisations. My support can begin with the development of a digital strategy. The strategy identifies the purpose of Digital, how it can help an organisation achieve its objectives and ambition as well as what skills, roles, planning processes and technical or business systems are needed to achieve this purpose. Through this process and, when I'm asked to help with the strategy implementation, I work alongside organisations’ digital leads – who are essential in making digital transformation successful – mentoring and supporting them in building up their own leadership and influencing skills. Since Digital Leadership Ltd was established, I’ve helped shape Communications and/or Digital teams. I provided support for the recruitment of digital roles, digital campaign planning and project management and developed training and mentoring for staff and senior management. I work on my own as well as with other agencies and consultants, combining best skills to achieve best results for clients. I’ve established the Digital Leadership Forum (DLF) and quarterly DLF refreshers. I am NCVO trainer and a CharityComms mentor. Sign up and we'll be in touch with useful nuggets and opinions about digital leadership and information about our events, including Digital Leadership Forum. Thank you for signing up to digital leadership emails! You will shortly receive an email, click on the link to confirm your subscription. We won’t share your information with anyone else and you can easily unsubscribe at any time. 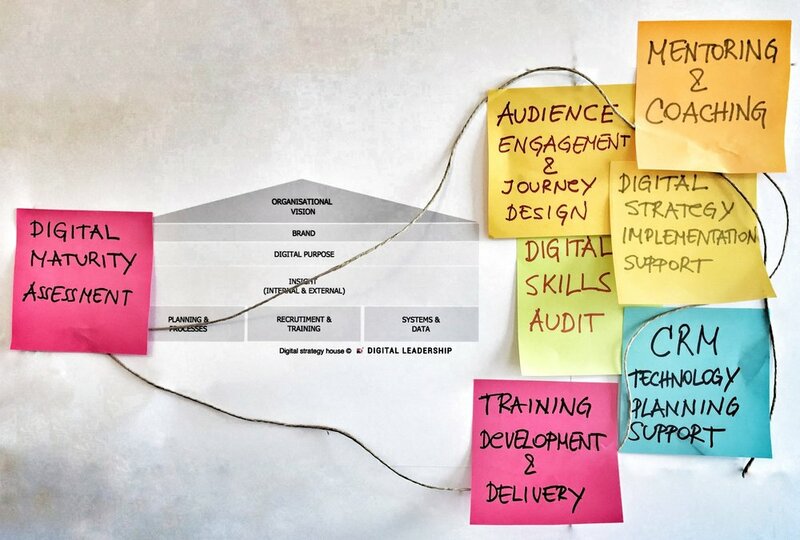 In the digital strategy development process we identify the main purpose of Digital for your organisation, drawing from organisational strategy and brand. With this focus, we can pinpoint what needs to be done in the areas of Planning & Processes, Staffing & Training and Systems & Data in order to achieve this purpose in the short and long-term. The engagement of main stakeholders is weaved into the process throughout. Once we know what needs to happen in order for your organisation to gain the most out of your digital output we can identify what skills and behaviours in staff are needed. Digital skills and behaviours audit will show us where the organisation is at and help us identify what kind of support and personal development is needed to bring everyone to the necessary level. I help organisations with main aspects of digital (transformation) strategy implementation: creation of planning processes which start with audiences and focus on engagement journeys; the development of training to improve skills; help with recruitment and building teams; design of new technology systems to support the strategy; CRM planning – from email strategy to audience journeys. I developed the Digital Maturity framework which helps organisations identify how ready they are to digitally transform. Digital Leads can use the digital maturity test & analysis to communicate to their organisations what steps they need to take to develop an effective digital operation and to gather support for the digital transformation process. The Digital Maturity assessment can also be the initial stage of the digital strategy development. Mentoring is provided to Digital Leads or Senior Managers to support them in leading digital strategy implementation. Based on the challenges ahead we set mentoring objectives which we work through in the series of 6 monthly sessions. Refreshers are coaching events when Digital Leads discuss main challenges in leading Digital and practice soft leadership skills. Positive stakeholder engagement is an essential part of any successful digital project. But what is a stakeholder - really? And how do you make, interpret and apply a stakeholder map? I’ve got you. What can the Digital Leadership Forum do for me? The benefits of this year’s DLF are a nice mix of the practical and personal. Attending will give you increased confidence in your ability to lead digital change, and you’ll get practical tools and tactics that you can use at work. Through coaching and mentoring I often hear about the workplace challenges digital leads experience. So here's a selection of scenarios which, if you work in digital, will feel painfully familiar. If you are trying to figure out how your digital operations can deliver more effectively for the organisation, get in touch and we can think it through together! Digital Leadership Ltd is a UK-based consultancy helping non-profits find the way to improve their digital output in the short and long term.